Actor Jerry Lambert and his production company are facing a lawsuit from former customer, Sony. 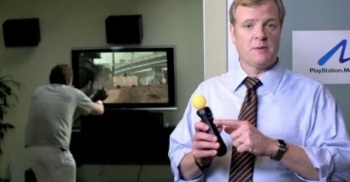 One of Sony's smarter decisions of this generation was to move away from its traditionally weird, terrifying and controversial advertisements in favor of the charmingly self-deprecating humor of Jerry Lambert as satirical exec, Kevin Butler. Now it turns out Sony is suing Lambert, his production company, Wildcat Creek Inc. and Bridgestone, after the actor played a very similar role in an advert for the tire company. The name Kevin Butler wasn't mentioned in the ad, which informs viewers that buying four tires could net them a $70 American Express reward card or a Nintendo Wii, but apparently Lambert's demeanor made someone at Sony think the company has a shot at a trademark infringement case. Bridgestone edited Butler from the ad, but Sony went ahead with the lawsuit anyway. Lambert has appeared in ads for Bridgestone before without incident, which seems to indicate it was the presence of the Nintendo Wii that attracted Sony's lawyer sharks. "The claims are based on violations of the Lanham Act, misappropriation, breach of contract and tortious interference with a contractual relationship," Sony said in a statement issued to Kotaku. "We invested significant resources in bringing the Kevin Butler character to life and he's become an iconic personality directly associated with PlayStation products over the years. "Use of the Kevin Butler character to sell products other than those from PlayStation misappropriates Sony's intellectual property, creates confusion in the market and causes damage to Sony." You can see the original, unedited ad here.